When it comes to the rarest, most valuable record albums, there are a lot of dollar signs floating around. The real prices turn out to be a little more grounded, although the figures themselves are elusive. 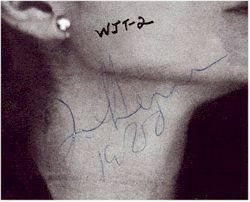 For example, in 1999, news broke that Mark David Chapman’s copy of John Lennon and Yoko Ono’s album Double Fantasy, autographed by Lennon five hours before Chapman fatally shot him, had been sold. The album had been found in a flower planter outside the Dakota apartment building, Lennon and Ono’s home on Manhattan’s Upper West Side and the scene of the Beatle’s 1980 murder. The record bears the forensically certified fingerprints of Chapman, and was even used as evidence in the case against him (Chapman plead guilty to second-degree murder). Price tag? $460,000. Or was it? Gary Zimet of Moments in Time, the New York memorabilia dealer who brokered the sale of the Chapman album said that the $460,000 figure released in 1999 was for publicity purposes, and also said the record was actually sold for $150,000. News reports several years later of the album’s sale for as much as $525,000 are also in error; Zimet said a deal was in place in 2003, but it fell through. He did note though that the album’s owner remains willing to part with it for around $600,000 (beware, though — upon the purchase in 1999, the owner received a number of death threats). But so far, the Chapman record has fetched only $150,000 (pocket change, right?). This changes the equation, in light of an eBay auction in 2006. 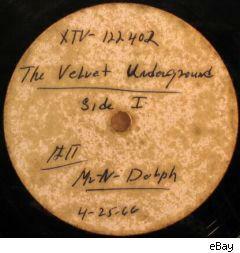 An acetate labeled “The Velvet Underground, Mr-N-Dolph, 4-25-66,” was purchased for 75 cents at a stoop sale in New York’s Chelsea neighborhood in 2002. The disc was discovered to be the prototype of what would become the debut album from New York’s widely influential Velvet Underground, managed by artist Andy Warhol. “Mr-N-Dolph” was Norman Dolph, a sales executive with Columbia Records who helped Warhol finance the band’s April 1966 recording sessions at New York’s Scepter Studios, from which the acetate’s contents were culled. Acetates are essentially lacquer drafts of a record, pressed in handfuls, which quickly become useless after repeated playing. At one point, there were probably several discs identical to the Chelsea find in the band members’ possession. Circulating MP3s of the acetate are reputed to have come from Velvets drummer Maureen Tucker’s copy. The acetate differed from the band’s first album, The Velvet Underground and Nico, in a few crucial ways. While some of the takes actually ended up on the album, albeit with different mixes (it’s these sorts of anomalies that make certain records valuable in the first place), other tracks from the acetate were completely re-recorded on the final album. When the dust settled on the eBay listing of the prized acetate (PDF link), the winning bid totaled $155,401, a few thousand more than was paid for Mark David Chapman’s Double Fantasy. So then, the Norman Dolph acetate is the rarest record? Nah, of course not — the six-figure bids were just eBay bidders monkeying around. A second auction was held, and the acetate sold for only a sixth of the initial price, just $25,200. That’s $125,000 less than the 1999 sale of the Chapman record, and for that matter less than other notable public record sales. Still, at least one other record exists, more rare and mythical than both the Chapman record and the Velvets’ Scepter sessions. In 1981, John Duff Lowe planned to auction the lone 10-inch acetate made from 1958 recordings of his old high-school band, The Quarrymen. 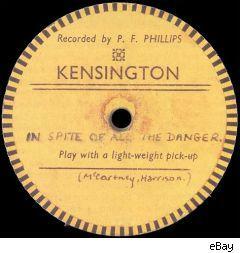 The disc’s A-side was a cover of Buddy Holly’s “That’ll Be The Day”; the B-side, though, featured an original song, “In Spite Of All The Danger,” penned by two of the band’s guitarists, Paul McCartney and George Harrison (the third guitarist, John Lennon, had formed The Quarrymen a couple of years earlier with his best friend, Pete Shotton). The acetate is the first theoretically-available recording of three-fourths of The Beatles, although a 1957 reel exists chronicling a Quarrymen performance prior to McCartney and Harrison’s joining the group. Lowe’s auction plans were scuttled when McCartney’s lawyers swooped in and negotiated the acetate’s sale to Sir Macca for a quiet sum. McCartney had the recording cleaned up and pressed into a reissue run of 50 singles, which he gave to friends and family. These repressings have been valued at as much as $20,000 each; fortunately for Beatles fans, the recordings themselves kick off the band’s six-disc Anthology series of outtakes and rarities, which was released in 1995.